The Upper Peninsula is no epicenter to skyscrapers and highrise buildings. 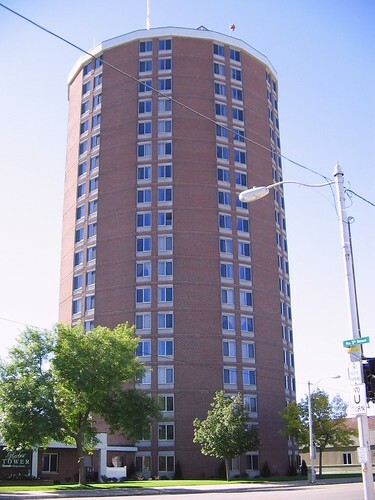 When driving through Marquette or Houghton you’ll count just a few buildings that scratch the sky around 10-stories. But if you want to see the real deal, the omega of Upper Peninsula skyscrapers, make your way to Escananba to see the tallest building in the Upper Peninsula. As you can see it’s perhaps not the prettiest building in the Upper Peninsula. It probably won’t be gracing the cover of architecture magazines anytime soon. But none of that matters. We’re here to celebrate the tallest building in the Upper Peninsula. And in the left corner, measuring in at 18 stories…. Hhhaaaaarrrbor Toowwwweerrrr. It doesn’t look like the Upper Peninsula will be getting a Trump Tower anytime in the next decade. So until then, if you’re looking for highrise living in the Upper Peninsula, head to Escanaba.